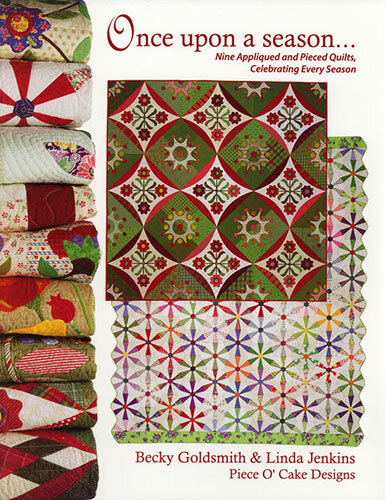 Here are some of the quilts from our book, Once Upon A Season, which is out of print. Click here to buy the eBook at pieceocake.com. Click here to find other books by Becky Goldsmith and Linda Jenkins. Please do visit pieceocake.com. Winter Dance from the book Once Upon A Season by Becky Goldsmith & Linda Jenkins. Quilt by Becky Goldsmith. Swallows In The Window from the book Once Upon A Season by Becky Goldsmith & Linda Jenkins. Quilt by Becky Goldsmith. Spring Wheels, below, is available as an individual epattern. Click here for more information. Spring Wheels from the book Once Upon A Season by Becky Goldsmith & Linda Jenkins. Quilt by Becky Goldsmith. Cottoon Boll from the book Once Upon A Season by Becky Goldsmith & Linda Jenkins. Quilt by Linda Jenkins. Poppies From the book Flowering Favorites by Becky Goldsmith & Linda Jenkins. Quilt by Linda Jenkins. There’s only one season – Quilting Season! Once upon a season, I taught myself to quilt! I would love this book. The poppies are so beautiful! Keeping the appliqué where I want it is still a challenge. As I don’t like to pin as much as I should. Winter Dance is SO beautiful! I want to learn needle turn applique. This is a good way to start. Thanks! Your quilt patterns always inspire me. Especially the Christmas ones. I Learned to applique using your instructions years ago, I would love to add another one of your books to my collection. Thank you for the opportunity to enter. Spring Wheels intrique me and my stash of fabric just waiting. Spring Wheels would be so much fun made from scraps from my stash and my quilting friends’ stash! Love the poppy quilt. They look so life-like. The poppy quilt is fresh and charming. I want a go at it. Thank you. I love every one of the quilts in this book! Would love to win it and make them all. I would love to win a copy of this book ~ I especially love the poppy quilt. All of these quilts are beautiful! I have several of your books but I missed this one. I attended a class with you once and it was a grand day. Thank you for inspiring me with your classes, books and blog. I’d love to win this book! Quilting is my therapy & I love the quilts in this book! Your quilts are beautiful! I would live to win this book! What beautiful inspiration! I’ve not been able to quilt recently, but with my youngest getting ready to enter college, I’m looking forward to having more time to indulge my creative side, and your website and patterns certainly do the trick! Thank you! You ladies are amazing! Such beautiful quilts. Glad to know we can still get the book if you don’t win. I especially love the pattern Spring Wheels. After a dreary winter it speaks of the renewal of spring flowers. So happy! Winter Dance is fabulous. Pick me, pick me! Add me to the list of people who would love this book. The hard part would be picking out which quilt to make first. Wonderful! Thank you for the opportunity to win! Love the Swallows In The Window quilt. Several years ago I drafted and made a similar block. Part of the fun is in the drafting. Ooh, my the cover quilt alone is enough to cause me to want this book, but then there are swallows, and poppies and…so many lovely patterns, this would keep me busy a long time! Quilting is new to me, but at least three generations of my family before me were quilters, so I am delighted to be in a place in life where I can now learn. Being an out-of-print book makes it even better because old books are also treasures! Stunning quilts. I can’t wait to choose my next projects. Needle turn appliqué will be my appliqué technique. Thanks for a chance to win your book!! Love your quilts. Appreciate the opportunity for the chance at your giveaway. Prior to this, I did not know that Winter Dance was your design and is a favorite when I see it. I also like Cotton Boll. I’ve been looking for the perfect scrap quilt to make and I’m loving the Spring Wheels quilt!!! Just starting to appliqué. Would love to have this book to make the poppy quilt. Beautiful quilts. Dear Ladies, Your fresh ideas and ones past make my heart sing. Love looking at all your lovely quilts! Just looking at your books is a joy!! Reminds me not to give up on Spring. Thanks. I Just love your books and all the work that goes into great quilts, happy applique and quilting.